As mentioned recently, I have officially closed out Niche Site Projects 1 and 2. In today's podcast, Perrin and I have a discussion on lessons learned during the projects and bring them to a conclusion. Everything in this podcast is basically covered in this recent blog post. In addition, we also discuss Niche Site Project 3.0 briefly. Listen to the podcast to hear our excitement for the new project. However, you can get additional details on what the project is all about by reading my last blog post here. As always, I hope you enjoy the podcast and feel free to leave any comments below. Thanks! Thanks guys, I love listening to these during my work outs! Just curious, how much keep up maintenance are you doing on your old niche sites (other than projects 1 & 2)? Are you still adding articles to any of them? Are they still generating $? I do very little maintenance on my older niche sites. I do have a couple that get articles every once in a while (fairly rare). Yes, I still have many older niche sites (before NSP 1 and 2) that generate money. I also have several newer sites that I’ve never really discussed that make money. Perrin says in this episode at about 20:45 that Amazon earnings are after taxes, net. I earn about $500 a month off Amazon and they do not take taxes out of my earnings. Were you referring to sales tax only? Am I missing something? Thanks and great job as always guys!!!! Agreed – i was confused by this too. You would still have to pay income tax based on amazon earnings wouldnt you? Clarification would be great! Yep; I misspoke (and misunderstood). Gotta pay those taxes! Hi Spencer you are doing niche site again? but I still think you should focus on Amazon FBA project which is more potential. I was earned 1000+ per month from amazon niche site (thanks for your sharing), but now I focus on ecommerce and earn $10000-$15000 per month (inspired by your post again），so I hope you write more about amazon fba. I haven’t given up on FBA…I do both. Looking forward to Niche SIte Project number 3. I think both previous case studies were excellent learning opportunities regardless of their final outcome, (sad to hear how they both ended, but this does not take any credit away from the experiment), and i am very interested to see what you come up with next. Thanks Spencer and Perrin! It is so rare, in the internet, to hear retrospectives. Too often all storytelling is front-loaded: All hype and excitement that soon fizzles and disappears. 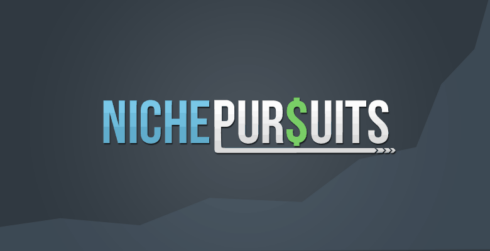 Niche Pursuits has a had a big impact on what and how I’m doing business online. I have a fledgling authority website now that is seeing good growth. Also, solely because of Spencer, I’m getting involved in Amazon FBA. I got my first samples last week and am excited to see where it goes. I’m excited to read more about the Niche Site 3, but also follow the FBA updates with interest. Thanks Rauno…and congrats on your new FBA business! Hey Spencer! I’ve been digesting all the content regarding your NSP1 and NSP2 but I kinda hit a wall on keyword research. I kinda found a keyword that seems perfect to rank. 3K searches and looks pretty easy to rank. My question is: Is google giving priority on .review domains if your website is about product reviews? Thank you so much and keep the good work. I don’t believe google is giving any preference to the domain extension. Perhaps it has to do with keyword relevancy. Hard to say without seeing all the data. Congratulations for your marathon. I’m also a marathoner, and my PR is 3:35. I got this time at Stockholm Marathon last June. I hope get sub 3:30 in Cincinnati next year. Now talking about websites. I used to have many niche sites, but today I’m more concentrate in one authority site. My new project has only 3 months, and I’m already getting pretty good results. My audience is in Brazil, so I have way less competition than English written websites. So farI have 13 podcast episodes interviews the top influencers of this niche and 20 videos. These interviews are generating great backlinks in other related websites. I’m not getting organic traffic yet, but I’m pretty sure that in 3-4 months, Google will start to rank my post really well. I can’t forget to mention that I’m using Long Tail PRO to get my keywords. I just want to thank you and Perrin for all the taught over the years. Thank you! Thanks Eduardo! Good job on your PR of 3:35…and good luck in Cincinnati (this is where Jake is by the way!). Congrats on the early success with your site, sounds like you are on the right track.